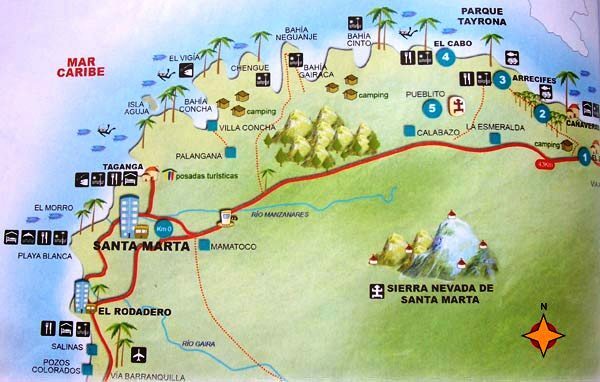 Hotel Boutique Casa Carolina’s recommended tours for beaches and adventure trips in Santa Marta, Colombia. 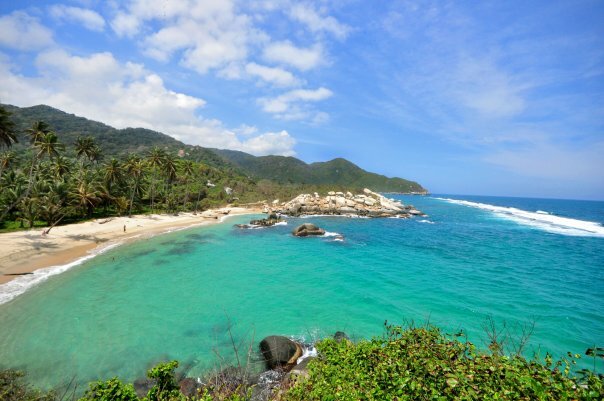 The very best way to experience Parque Tayrona and the Caribbean coast is with a private or group speed boat trip on Hotel Boutique Casa Carolina’s newly renovated 24 foot Mako speed boat, Samoa. With brand-new twin 115hp engines, music system, lifejackets and full safety equipment, insurance and cool box, snorkeling equipment to borrow; this is by far the quickest, safest and most enjoyable way to visit Santa Marta’s stunning coastline. 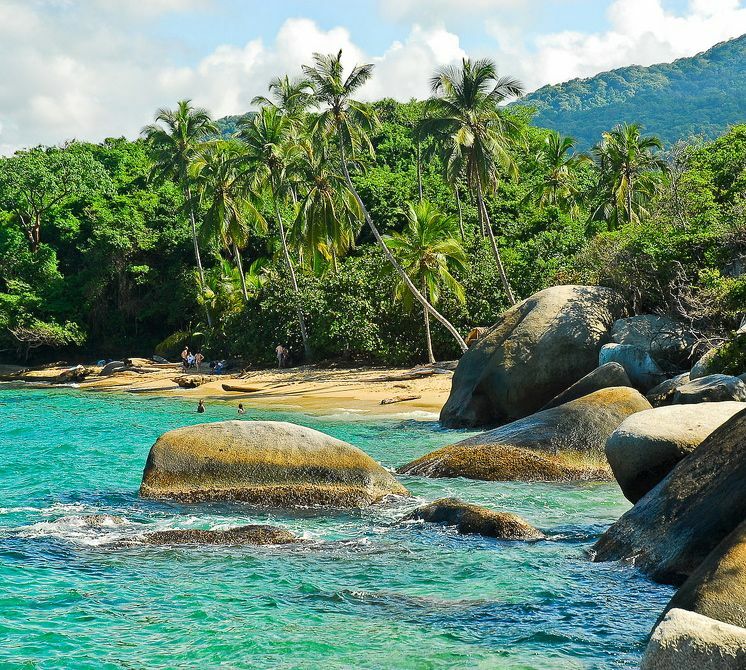 This trip leaves Santa Marta’s Marina at 8.30am returning around 3.30pm, visiting two different beaches, with lunch available to buy at the second. The boat and crew stay with you all day, giving a unique, exclusive and personalised service. This tour operates whenever we have a minimum of six interested guests and costs 150,000 pesos per person. Lunch is available additionally from Eli’s Restaurant at Casa Carolina for 25,000 pesos per person. Private charter of the boat and crew is possible with a cost of 1,500,000 pesos per day. 1. Go it Alone > An hour’s taxi, or 90 minutes bus, to the park entrance and then 1¼ hour jungle path to arrive at the beaches around Arrecifes. From here you can walk as little or as much as you like to discover other beautiful spots. If you walk 90 minutes beyond Arrecifes you get to Cabo San Juan, passing many lovely beaches on the way. There are simple beach restaurants selling fresh fish lunches, juices, water etc. Entrance to the park is 40-48,500 pesos per person for tourists, or 17,500-19,500 pesos for Colombian residents, depending on high/low season. The taxi to the park is around 190,000 return trip, or a bus 20,000 per person return trip. Please ask Casa Carolina’s concierge service for further advice or to book. 2. Bus Tour > Operated by Magic Tours, reserved for you by Hotel Boutique Casa Carolina. Leaves daily for both Cabo San Juan (entering at El Zaino and walking via Arrecifes as described above) or to Playa Cristal (great for snorkelling, no walking required). This organised tour costs 110,000 pesos per person (83,000 for Colombian residents) and includes entrance to the Park, a guide and road transport, but not lunch. For both trips, guests are collected from Casa Carolina around 8am by car and transferred to a larger coach at a central meeting point nearby. Guests are dropped back at the Casa Carolina, or a short walk away at around 5.30pm. In peak season tours may leave much earlier in the morning to ensure entry to the park. Please check details with Casa Carolina. 3. 4×4 Tour > A similar itinerary to Magic Tours’ bus trip, but a more personalised service with pick up and drop off at Hotel Boutique Casa Carolina in a 4×4 Jeep. Prices start at 125,000 pesos per person, based a group of four, though the cost is higher for a fully private tour for just one person (up to 375,000 pesos). Don’t hesitate to ask Casa Carolina’s reception staff for more details or to book. 4. Speed Boat > An adventurous alternative to either Cabo San Juan or Playa Cristal is by speed boat from Taganga, also offered by Magic Tours. Guests catch a taxi from Casa Carolina around 9.30am as the boat leaves at 10am each day. The taxi takes around 10 minutes and costs 10,000 pesos each way. The boat costs 45,000 pesos per person each way, not including entrance to the park or anything else. The boat drops off at the beach and leaves, picking up in the afternoon. One way tickets are possible (walking out of the park via Arrecifes). WARNING at various times of the year it can be very windy and the waves can make the trip in these old fishing-style boats pretty rough. Not for the faint hearted!! 1. Pueblito (traditional indigenous village in Parque Tayrona) > An all day guided trek, around 6-7 hours, passing the beaches in Cabo San Juan and Arrecifes on the way back. This trip offers an insight into the life and culture of the indigenous people of the Sierra Nevada. 252,000 pesos per person assuming at least two people sign up, the price includes pick up and drop off from Casa Carolina, transport, guide and entrance to the park. For larger groups discounts can be negotiated. 2. Minca > A fun and diverse day out; take a dip in the river and waterfalls, enjoy stunning lush tropical scenery, unique flora and fauna, an organic coffee plantation and brewery! This half to full day trip can be adapted according to your budget with public buses running regularly, group tours, or taxi and private tours. The group tour costs around 110,000 pesos per person with Magic Tours, or a more exclusive tour with Fidel Travels by 4×4 costs between 140-160,000 pesos per person depending on the size of the group. Hotel Boutique Casa Carolina will be delighted to give you more information and reserve your preferred option. 3. Ciudad Perdida > The hike to Ciudad Perdida is TOUGH, but all our guests have absolutely loved this utterly unique experience. The tour can be completed in four or five nights (five or six days hiking), camping in hammocks along the way. In our experience, guests have preferred completing the tour more quickly! 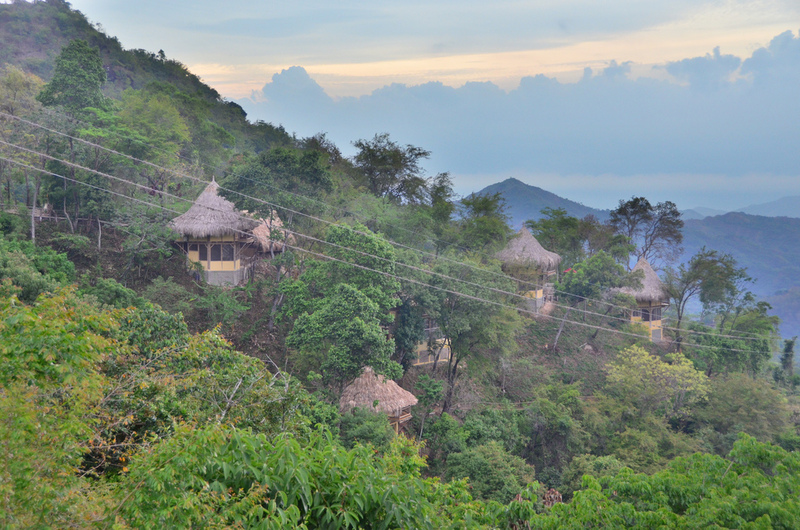 Ciudad Perdida can be booked through various operators, but we would recommend Turcoltravel. Casa Carolina is happy to book for you, or give you further information. The cost of the tour is 850,000 pesos per person (300 USD) and includes all transport, wood and drinking water, accommodation and a guide for the entire trip. 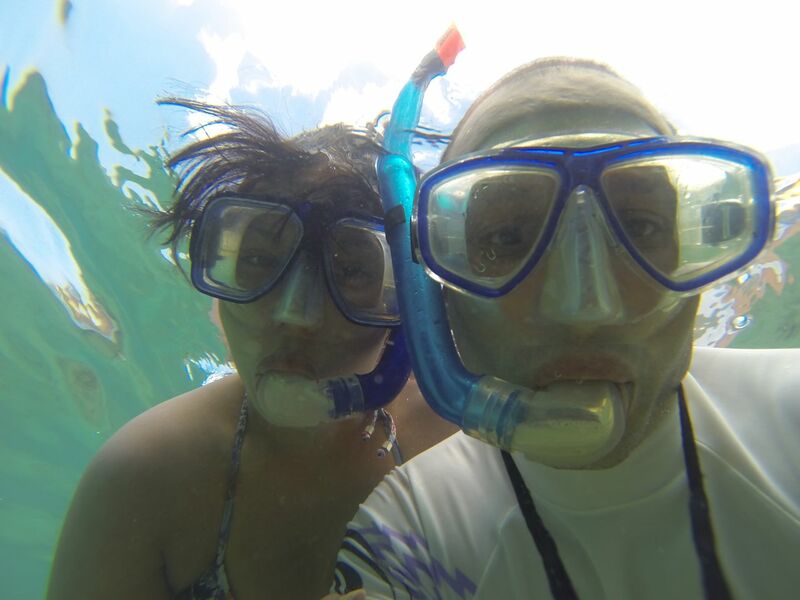 Our guests have always enjoyed diving with Atlantic Divers. Atlantic offer a refresher course of a three hour excursion with one dive for 100,000 pesos (40 USD) and also a double dive on a reef and wreck, costing 160,000 pesos (total excursion time four hours). For both outings they collect from Hotel Boutique Casa Carolina and include light refreshments. There are many other alternative dive packages and dive companies available. Get in touch with Casa Carolina for more information.